What Day Of The Week Is August 13? 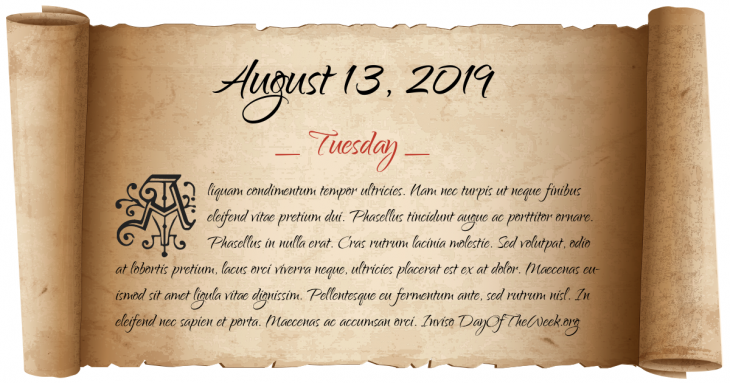 August 13, 2019 is the 225th day of the year 2019 in the Gregorian calendar. There are 140 days remaining until the end of the year. The day of the week is Tuesday. Tenochtitlán (present day Mexico City) falls to conquistador Hernán Cortés. King Louis XVI of France is formally arrested by the National Tribunal, and declared an enemy of the people. The Convention of London, a treaty between the United Kingdom and the United Provinces, is signed in London. Nat Turner sees a solar eclipse, which he believes is a sign from God. Eight days later he and 70 other slaves kill approximately 55 whites in Southampton County, Virginia. Spanish–American War: Spanish and American forces engaged in a mock battle for Manila, after which the Spanish commander surrendered in order to keep the city out of Filipino rebel hands. The Battle of Shanghai begins. Major General Eugene Reybold of the U.S. Army Corps of Engineers authorizes the construction of facilities that would house the “Development of Substitute Materials” project, better known as the Manhattan Project. Hurricane Charley, a Category 4 storm, strikes Punta Gorda, Florida and devastates the surrounding area. South Ossetian War: Russian units occupy the Georgian city of Gori. Who were born on August 13?